What an adventure! Right after Farmer’s Market, Bill and I met Sandra at Arby’s and headed to SLC. It was a hot day so we were running the air conditioner. Bill’s van’s engine ended up heating up too much and we had to stop by Auto Zone on 106th while waiting for Bill, I saw my brother-in-law Joel (he works there). Bill put it in and we were on our way . . . we didn’t make it too far . . . the van stalled at the intersection. We couldn’t get it to start again. We pushed the van across the street and coasted to a shady spot behind the Harmon’s there. We waited about 40 min for the car to cool down. We think it was a vapor bubble. We got the mile or 2 left to go without any problems. We saw Miste, Mary Louise, Brenda and her daughters, Tina Howard and her whole family, Jo and Fred Knowlton, Tim and Dee Knowlton. I got Mim knits new book and roving. Bill got some roving and a drop spindle. On the way home we stopped at Winco. I love that store. We made it home safetly. Rachelle is now 3 months old. She is starting to coo, she isn’t very noisy though. She might not talk our ears off like the other 2. She tries to get her whole fist in her mouth, is starting to play with the toys on her exer-saucer, she loves her Eeyore and always wants to sit. Thank heaven for the Bumbo chair! 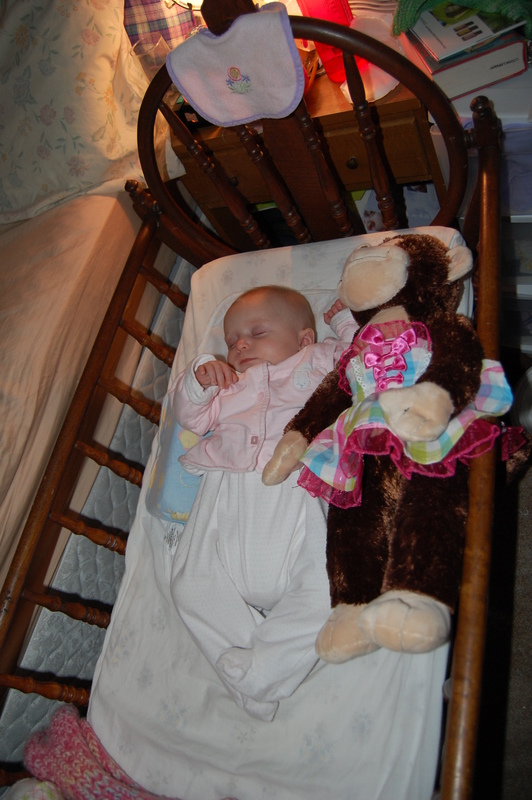 She is longer than her monkey now. We are still wearing the 0-3 month clothes, but it won’t be long until she is into the 3-6 months clothes. Some of them I will be popping out this week.